Innis & Gunn sells its beer in clear glass bottles, so I have no choice but to begin this review with a mini-rant. Dear Innis & Gunn: No. Stop it. Just stop it. Selling beer — especially beer that has to be shipped across the Atlantic — in clear glass bottles drastically increases the chances that that beer will be skunky and gross by the time someone gets to drink it. You're shooting yourself in the foot. It's the equivalent of selling frozen hamburgers in Ziplock bags, or showing up to a first date in your college sweatpants. If you care at all about the integrity of your own product, do not sell your beer in clear (or green!) bottles. So given all that, it's already saying something that I took a chance on a four-pack of Innis and Gunn (Original) Oak Aged Ale. After trying a few sips of a friend's a few months back, I was surprised how much I enjoyed it — I can actually give it credit for kicking off a whole mini-obsession with oak-aged beer. See, Innis & Gunn's strength is that this isn't your typical oak aged beer — which usually will be some kind of stout, barleywine, or other high ABV dark beer. 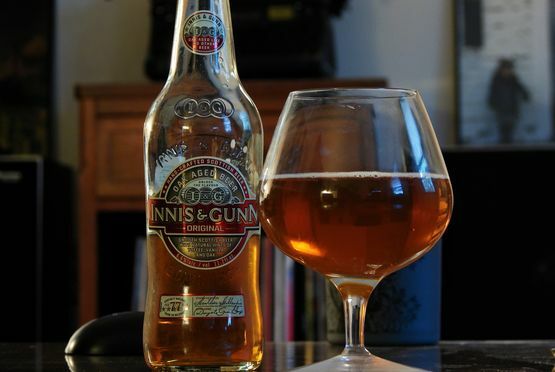 Innis & Gunn is closer to a British pale ale than a Scotch ale or wee heavy, and while that light, mild body doesn't bring a whole ton of complexity, it does let the oak really shine. As the label suggests, notes of vanilla, toffee and oak are dominant, with a gently sweet, caramely, candy-like finish. There are hints of bourbon, but no biting boozy character like you'll find in oak aged imperial stouts — which is nice. Hop presence is buried, and maybe somewhat oxidized thanks to that damn clear bottle, but there are so few hops to be met here that it's not ready to ruin the beer. Malts only make themselves known in the sweetness and the body — which is full and pleasant, with crisp carbonation. Truthfully, this tastes like cream soda in beer form. I don't mean that condescendingly, either — it's a sweet-but-not-overly blast of vanilla, with just enough depth from the oak aging to mark its place as a unique beer. And it is really quite unique — I'd love to see more low ABV styles get the oak treatment to see how they benefit. I'm surprised the American craft beer scene hasn't produced more beer like this already. This is a risky beer to buy, given its packaging, and it's not going to blow anyone away with its complexity. However, if I lived in the UK and this was available at my local pub for a reasonable price, it would absolutely be one of my go-to beers. Availability: Fourpacks of 11.2 oz clear bottles. Also available in bombers. Fairly easy to find in most stores with a good selection. I Love Innis and Gunn! It was one of the first beers i tried that really got me into craft brews. great review, and I look forward to more!